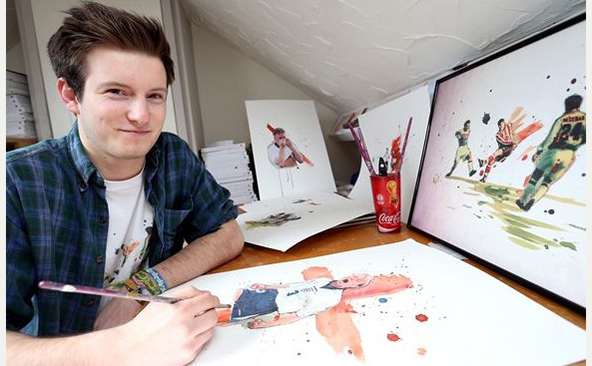 Nottingham UK: Gabe Cuthbert is a 19 year old artist who has done the near impossible; got me talking about football! 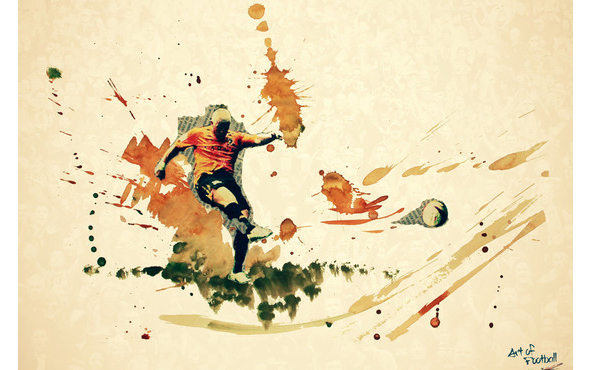 Something I’ve come to realize (thanks to having two raving football fanatics as older brothers) is that football fans usually have an uncanny memory. They may not be able to tell you what they had for breakfast that morning, but they’ll talk their heads off recounting all of the disallowed goals in favour of South Korea in 2002, or when Cameroon beat Argentina in 1990, or Ronaldo’s performance during the 1998 final against France. 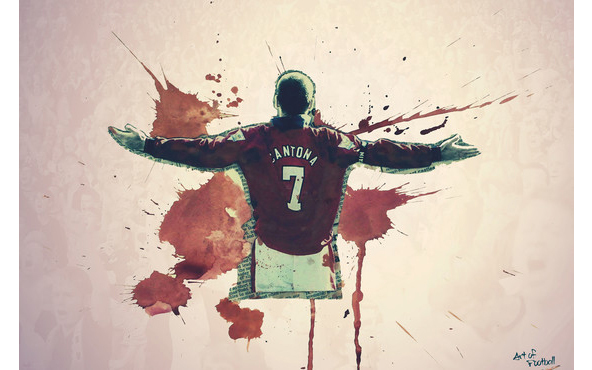 And yes, I did have to do some research to come up with those anecdotes because I don’t know the first thing about football – don’t judge me – but I do know about being passionate about something. The mentioned realisation has come to mind recently only because (I can’t be the only one) it feels like we’ve been waiting for this World Cup FOREVER. Unfortunately, there is still a month ahead and all we can do for now, like with every other major event that doesn’t seem to arrive ever, is to look back on previous editions. 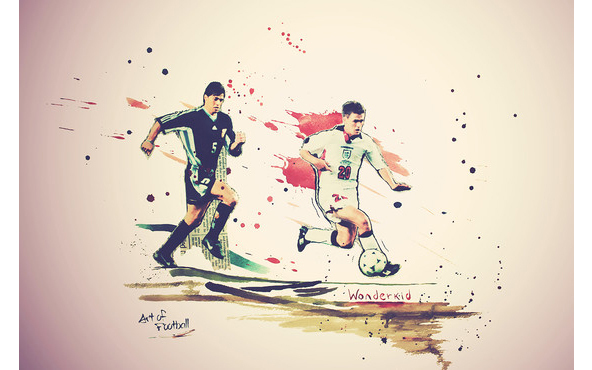 A fan who’s been doing just that and using his knowledge of football creatively is Gabe Cuthbert. 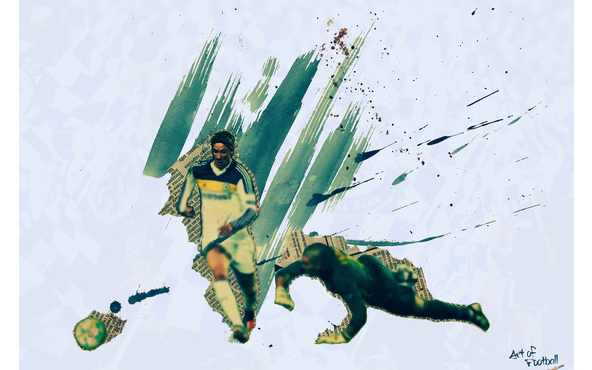 Mixing realistic figures with watercolour and collage type of backgrounds, this 19 year old has been able to capture some of the English football history’s most dramatic moments in a fashionable manner. Gabe started creating t-shirts for himself, but eventually, fulfilling the dream of many working on something you’re passionate about, started selling them to others. His contribution cannot be understated. In a market filled with uninspired designs and rough graphics, Gabe’s technique and colour treatment flawlessly stand out. Stylish and yet wearable, delicate, yet not feminine, he has managed to create a product for a type of costumer who would typically not care. Gabe Cuthbert’s t-shirts go for around £20 and £25. If you’re interested, you might check them out at his website. It might also be a good way to kill time before the Cup starts.